Roskilde Fjord is probably already the water in the World with the highest concentration of Viking ships but now one more longship is added to the fleet of the fjord. On the 11th of May this spring the independent Maritimt Forsøgscenter (Maritime Experimental Centre) launches a longship inspired by one of the most famous Viking ships found in Denmark: The Ladby Ship. The new longship will be the second largest Viking ship in Denmark. Only second to the World's largest reconstruction of a Viking ship: The Sea Stallion. The new ship will be 24 meter long - 5 meter shorter than The Sea Stallion, but on the other hand it will have a width of 4,1 meter - 30 centimetre (aprox one feet) wider than The Sea Stallion. Most extraordinary is that the longship will have a depth of only 40 centimetres - almost making it possible enter a beach. This flexibility was one of the main forces of the original Viking ships since it made it possible to attack any unprotected coast. The Vikings Surf Board. The flat design was even more clear before the ship was finished. The very "flat" construction also gives the ship an extraordinary elegant design with beautiful lines. The inspiration - The Ladby Ship - is one of the most beautiful Viking ship constructions ever found - maybe only second to the Oseberg Ship. The man behind the new ship - Tonny Andersen - calls his ship "the Vikings surf board". He expects it to reach a considerable speed. He hopes to be able to reach 20 knots in good wind. 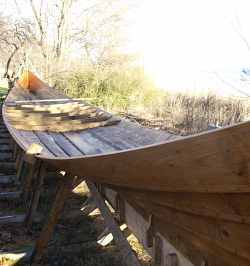 The new longship will have a sail of 70 square meters. The sail calls for attention because of its shape. It will be only 7 meters high and 10 meters in width. Wide sails like that are known from Viking age illustrations but are very rare in modern reconstructions. The ship will have space for 38 oarsmen (The Sea Stallion has 60). Tonny Andersen stresses that although The Ladby Ship has been an inspiration, the new longship is not a reconstruction of the archaeological find. 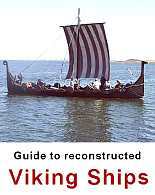 The ship is built - like in Viking age - without a printed design. It is based on the experience of Tonny Andersen as a ships builder and with inspiration from recent calculations and archaeological research on The Ladby Ship. Maritimt Forsøgscenter is a privately organized experimental centre financed primarily by sailing trips with tourists and event making. 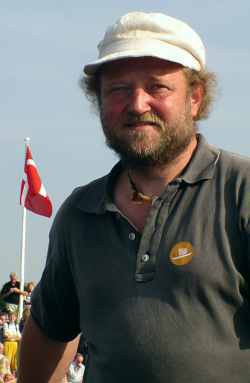 According to Tonny Andersen the new longship will be the worlds largest Viking ship built without economic support from governments and sponsors. A large part of the 3 years work has been done by volunteers. The maritime experimental centre already has a small fleet of Viking ships. Until now the largest ships in the fleet have been Nidhug and Røde Orm. The ships are placed in a small harbour at Lyndby Strand only 20 kilometres from The Viking Ship Museum in Roskilde hosting The Sea Stallion and a fleet of other Viking ships. Both harbours are placed by Roskilde Fjord which on top of that also is the home water of other Viking ships - among them Sif Ege. 14.30 The ship will be given name and launched. 15.00 Open ship. Viking fights, music etc. 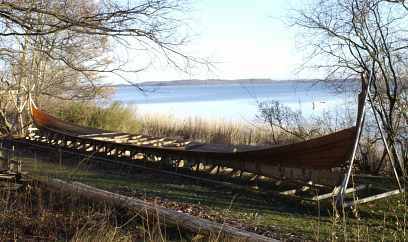 The ship will be launched at a beach on Roskilde Fjord. Other Viking ships are expected to participate in the event.